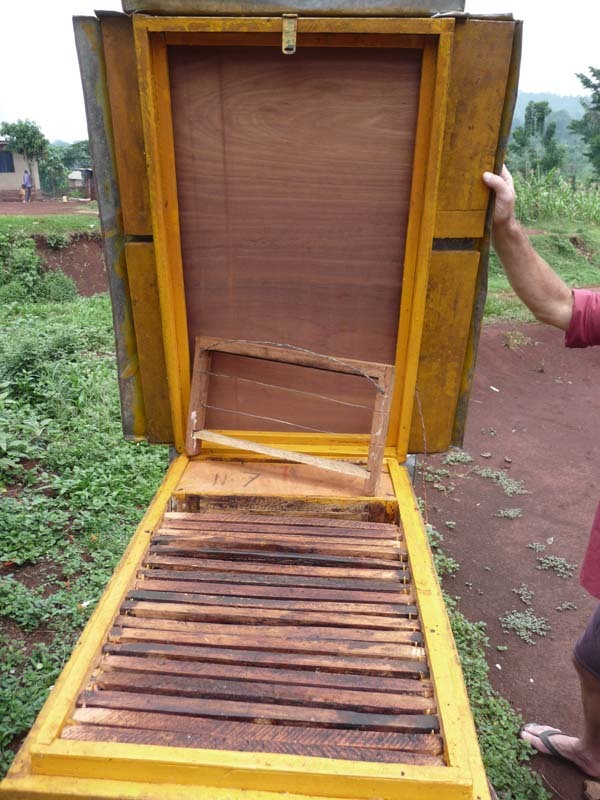 There is always this misconception that low cost beehives do not produce good quality honey. This is not true. 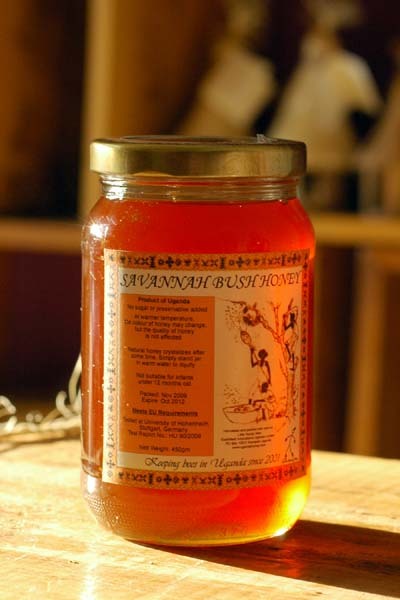 Honey from low cost beehives can be as good as those harvested from Kenya top bars or Langstroths. It is the lack of knowledge on when to harvest the honey, what to harvest in a hive. Most traditional bee farmer will not hesitate to grab whatever they find in the hive during the flow season. Even before the honey ripens, they would had taken them out. Lack of knowledge had led to the harvesting of poor quality honey. 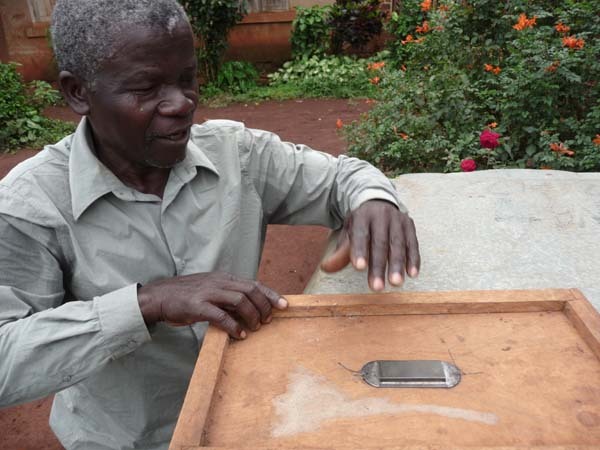 Below is a clip of one of our farmers inspecting his beehive. The honey inside this hive was not ready for harvesting. Beekeeping, a full time job……………………. 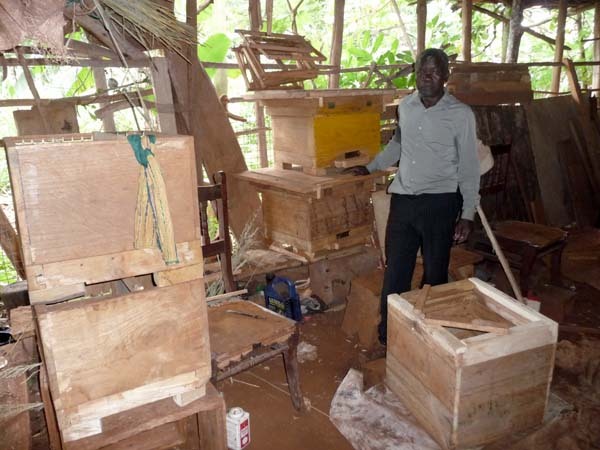 Many bee farmers in Uganda are lacking the skills in hive management. Many were taught to simply place the hives out into the woods, wait for it to be colonized and hopefully when the honey season starts, go and harvest the honey. At times they would discover that the hives are empty. They will just wait for the next colony to come. 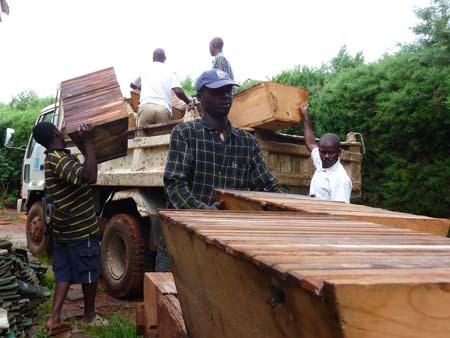 African bees are quick in absconding and a mismanaged hive is one of the reason. 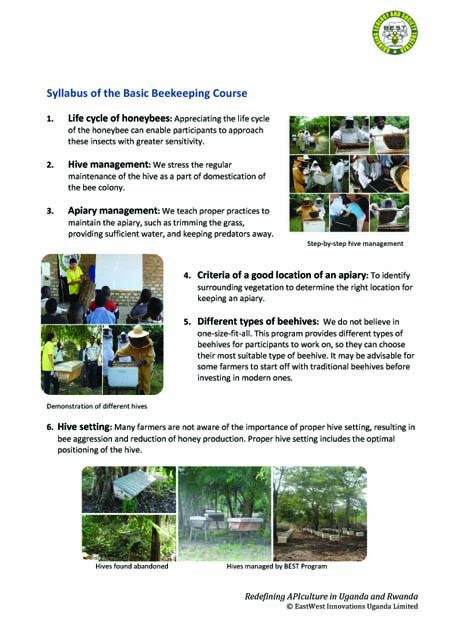 In one of our topics, we teach farmers the importance of hive management and to rectify any discrepancies. 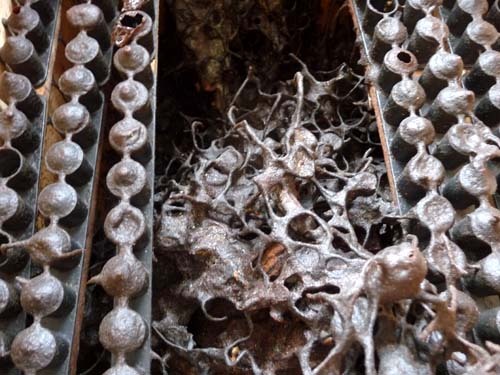 If the hive is not in good condition, eg wet or too many openings due to wood warping, they need to change the hive. In this video below, you can see one of the lessons in hive management. Preparation for the first course for the year……………………. We will be having our first course in one week’s time. Pre training hive inspections are done to make sure the course runs smoothly. A Very Happy New Year! 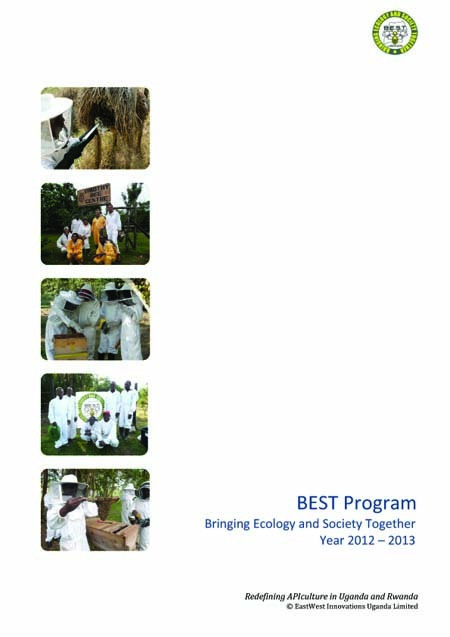 We are glad to present our latest BEST Basic Beekeeping Course Prospectus. You can download a PDF copy of the prospectus below. 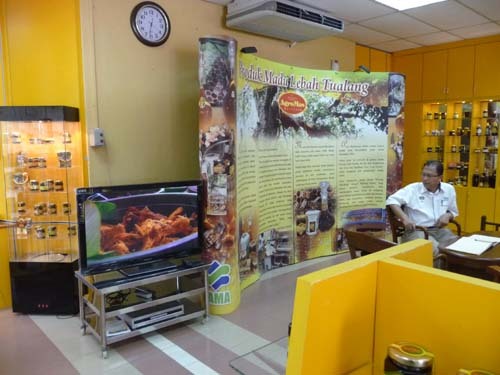 Beekeeping in Malaysia – Ulu Tiram, Johore (The final lap)……………………. After 28 days of traveling around West Malaysia, visiting researchers, professors and bee keepers, I had finally reached the place where all things will take place, Kampung Temasek, Ulu Tiram, Johore. Kampung Temasek is the main reason why I did this tedious feasibility study. Before we can ascertain that the project will take off on the right foot, we have to make sure that the potential of having a bee education centre and the introduction of beekeeping into the community will benefit all parties involved. For those who are unfamiliar with this project, basically Kampung Temasek is about “The School of doing”. The second houses from the right had been earmarked as the bee education centre. Kampung Temasek, The School of Doing is an outdoor laboratory for schools to run their curriculum such as mathematics, science, geography, history and others in a natural environment. Schools can experiment programs and activities that they cannot usually do in Singapore. For example, students can spend one week from their academics semester to learn mathematics through build a solar oven by calculating how much energy is collected from the sun and the science involve in cooking an egg or they can walk into the forest to learn about the bio-diversity and how the eco-system work. Our aim is to reinforce the students’ learning through Doing. City schools can now access this outdoor learning platform in just 30 minutes after Singapore Customs, in Johor Bahru, Malaysia! 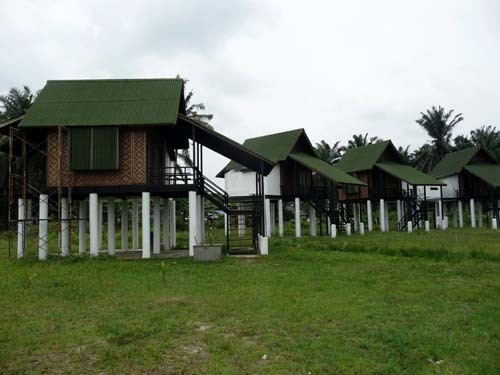 There will be many activities at the Kampung and my responsibility is to convert one of these houses into a educational centre where the younger generation or public will have an opportunity to get up close and personal with one of the most amazing insect, the honeybees. It will be a paradigm shift for them to overcome the fear and to learn to live these them harmoniously. Other than serving as a bee education centre, it will also be a place for the local community or “Orang Asli” to come forward to be trained as bee farmer, to have another source of income to provide for their family. In fact we had already identified a village to begin with. When everything is completed, Kampung Temasek will be a place where schools can bring the students to learn more about outdoors activities, closer to nature. Parents with their children, can explore on something more meaning, like understanding how trees, plants and insects help in balancing the ecological system instead of sitting in front of the computer 24/7. Reaching home on 28th evening, I then realized that my whole body was aching from all the traveling. Somehow the biological clock inside me was telling me its time I need a break. I can feel my whole body crashing in with flu, cough and fatigue. Beekeeping in Malaysia – Malacca (The feasibility study Part 4)……………………. 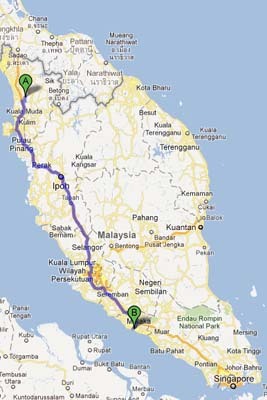 Bus route from Kedah to Malacca. Took a break half way at Kuala Lumpur. The bus ride from Kedah to Kuala Lumpur took almost 6 hours. I had a break in Kuala Lumpur before a friend of mine drove me another 2 hours further South to the thriving city of Malacca. Extracted from Wikipedia – Malacca (dubbed The Historic State or Negeri Bersejarah among locals) is the third smallest Malaysian state, after Perlis and Penang. It is located in the southern region of the Malay Peninsula, on the Straits of Malacca. It borders Negeri Sembilan to the north and the state of Johor to the south. 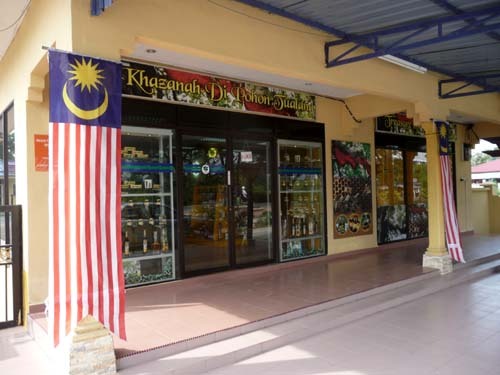 The capital is Malacca City, which is 148 km south east of Malaysia’s capital city Kuala Lumpur, 235 km north west to Johor’s largest city Johor Bahru and 95 km north west to Johor’s second largest city Batu Pahat. This historical city centre has been listed as a UNESCO World Heritage Site since 7 July 2008. Although it was the location of one of the earliest Malay sultanates, the monarchy was abolished when the Portuguese conquered it in 1511. The Yang di-Pertua Negeri or Governor, rather than a Sultan, acts as the head of state now. 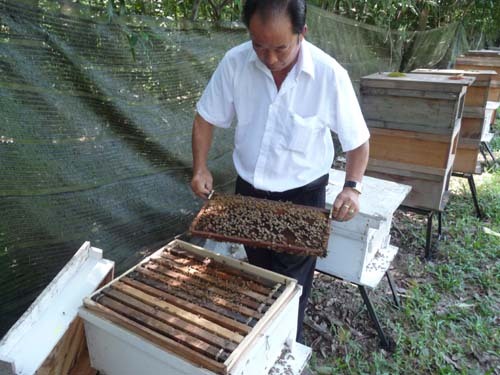 Mr. Ong had been a beekeeper for the last 25 years and his bee farm could be considered one of the largest one in the whole of West Malaysia. 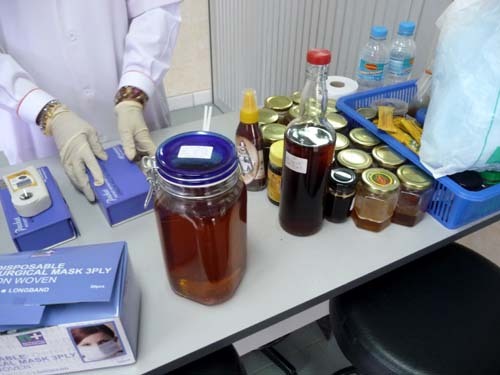 He used to keep apis cerana in the seventies but after the introduction of European bees, apis italiana, Malaysia honey industry using apis cerana was completly wiped out due to the introduction of viruses by the European species as well. Since then, the domestication of apis cerana had been unsuccessful until of late, many small scale farmers are beginning to use apis cerana again. it is a good sign that these species coming back. Right now, Mr Ong had been keeping the European species after learning how to treat them. He does not have any of the asian species anymore but instead started to keep stingless bees. He found keeping stingless bees are very interesting too. 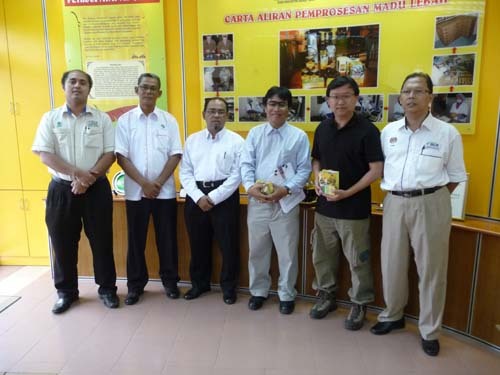 Beekeeping in Malaysia – Kedah (The feasibility study Part 3)……………………. Market control and extension, Strategies, Development of national food terminal, Marketing contract, Entrepreneur development, Export manuals, Development of marketing infrastructure, Market information and Branding and promotion. Frontage of the sale centre. 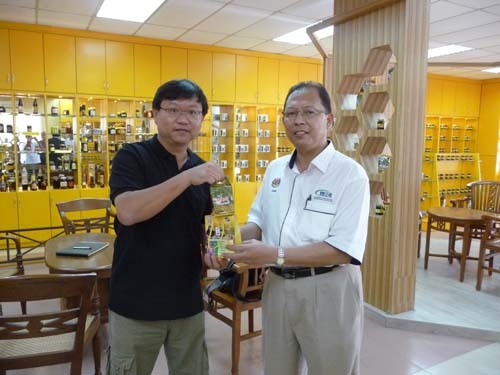 The setup was very professional and their marketing concept for Malaysia’s most popular honey, “Tualang honey” was very successful. I was really impressed with their presentation in the beginning. After a long discussion and exhange of ideas, my views changed. There was a video presentation at their sales department. Eco-tourism was being promoted at the sales centre. It showed the beauty of Malaysia rain forest and the mesmerizing journey one can embark on to see the untouched virgin forest. You pay MYR400 to join the eco tour. 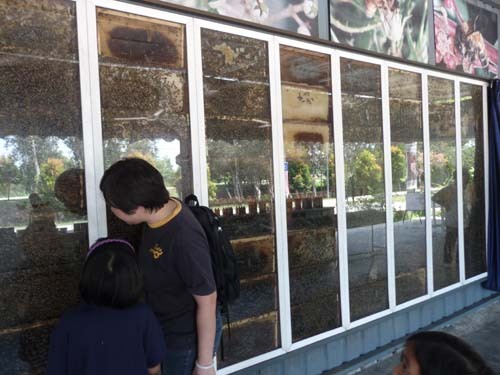 One of the main attraction were the sighting of the largest honeybees in the world, Apis Dorsata. You can see them colonizing on the tallest tree, the Tualang tree. You can even see these majestic colony from the ground. You get to see the harvesting of their honey during the night. Now here comes the sad part. In the video, I saw the destruction and killing of these incredible insect. These honey hunters climbed the tall trees to get to them. Once they were within range, they would use fire and smoke to chase and kill them in order to get to their honey. During the collection, many bees perished. Discussion with the officials during the visit. Being a bee keeper and a bee lover, I felt the pain when I saw the destruction during the harvesting process. Well I guess there is always this case where the market demand, supply have to be met. Due to the demand created by the market force, these honey were harvested as soon as the bees place them into the combs, even though when they were still unripe. Api Dorsata are very aggressive when comes to protecting their nest. The only way these local folks knew were to destroy them in order to get to their honey. The meeting ended with a tour to their honey processing plant. I left the place with a nice gift produced by FAMA. Slide presentation by FAMA staff. 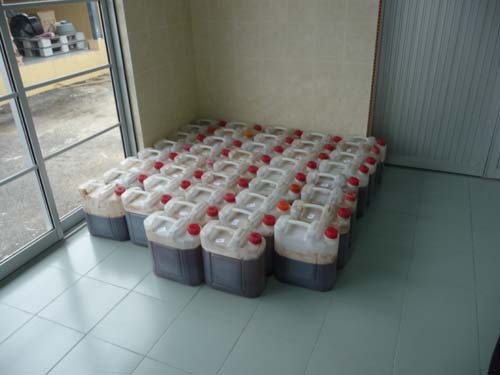 Small quantity of "Tualang" honey from the village. Getting ready for some basic honey test. Refractometer reading moisture content at 24.5%. EU honey standards, (20% max). Scrapping off the top foamy portion of honey. Honey being placed in a heating chamber to reduce moisture content. Gift presented by Mr. Mohd Zaimi Bin A.Razak (Division Director Product Development). 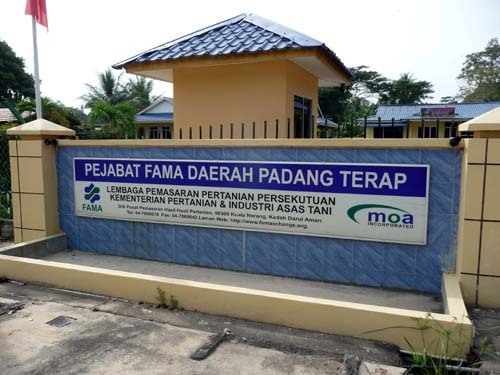 FAMA team from Kuala Nerang, Kedah. Colin with his neighbor, Monique, inside his first set of bee colonies. During my visit to Colin’s apiary over the weekend, I chanced upon a very passionate beekeeper. He has been keeping bees for more than 25 years. I was very impressed with his setup and he has a small workshop that produces all his hives. Colin had been passing his place a number of time but didn’t get a chance to stop. Since I was there, might as well make an effort to stop to see what is interesting. Mr. Wumale wasn’t at his apiary when we drove up to his home. He was at church. He was a brilliant marketing person I should say. He had his phone number painted on one of his wooden door and that was where we managed to contact him. His enthusiasm was contagious. He sounded like a hugh man over the phone but when he arrived, my perception of him changed. What was in front of me was a bouncy, petite guy with a big voice. I am quite certain his heart is as big as his voice. I managed to obtain a short interview with him and about his passion. 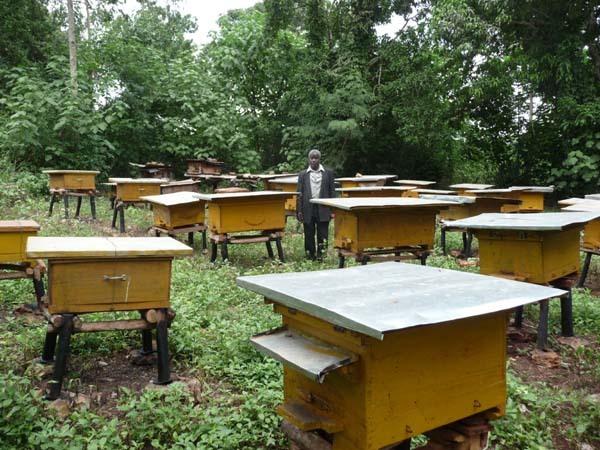 Mr. Wamule and his apiary. Mr. Wamule start beekeeping more than 25 years ago and his intention was to harvest honey and brood for his own family consumption. Brood mixed with porridge was a delicacy back then. His constant interaction with bees took him further than his homeland. He made an effort to wanting to learn more. 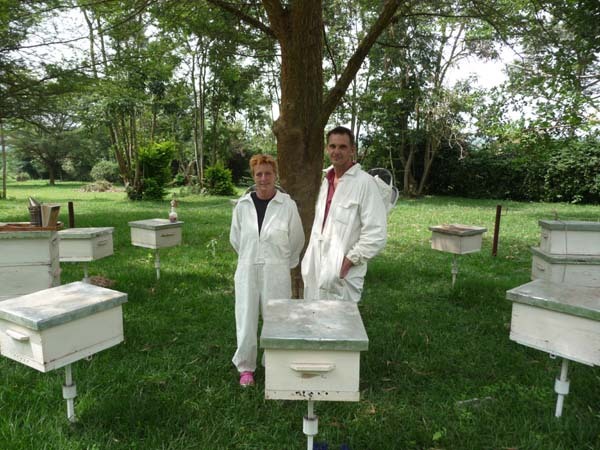 During the earlier years, beekeeping in Kenya was more advance so he took off to Nairobi to understand more about beekeeping. He wanted to develop his passion into a business. He came back equipped with knowledge and vision of how to modernized his way of keeping bees. I was impressed with his thirst for knowledge and the creativity of developing a system that suited him well. Walking through his apiary, you could see that he had combined the beekeeping method of top bar hive and langstroth. Being curious, I asked him why? He told me that after he had returned from Kenya, he decided to capitalize on both system. What is suitable for him and what is not. He felt that both system has it advantages and disadvantages. Having the top bar horizontal management, he does not have to exert himself when comes to harvesting. A super filled with honey can be very heavy for someone his size to lift. A combination of a langstroth and top bar hive. His quest for modernization was due to his passion and love for bees. He admitted that previously, due to lack of knowledge, he used to hunt for the honey and brood. He felt that this wasn’t the way to go in terms of sustainability. On top of that the destruction bees made him felt guilty. Then the wonderful phrase came out from him, “I love bees and I do not want to harm them”. You can see the twinkling in his eyes when he talks about how his system had reduced so much death within the hives during harvesting. You can sense his joy when he touched on his new way of harvesting his honey, with the introduction of the queen excluder and the bee escape. That was the best lesson he had learnt during his trip to Kenya. Many modern beekeepers might not find his discovery interesting, but for someone who had little or no resources, able to make an effort to progress is something highly commendable. Mr. Wamule was so ever willing to share. He brought us to an empty hive and explained how it works. Although it seems there are still rooms for improvement but the creativity does deserved an applause. Now that all his children had grown up and left to start their new life. He can enjoy his passion with a lighter burden on his shoulder. I guessed Mr. Wamule is one of the rare few in Uganda that will put honeybees first before money. *If you love your job, you don’t have to work a single day in your life – Confucius. The brood chamber of Mr. Wamule's hive. Mr. Wamule and his hive. The cover is hinged. Show me an African Queen……………………. Into the third day of the lessons, these future beekeepers got the opportunities to look deeper into what is happening in a hive. They were shown the different occupants and their job roles. As the days moved on, slowly they are getting more confident with their interaction with the African bees. Some of them had already taken off the veil so that they are able to see the bees and the interior of the hive more clearly. A comb was selected and placed away from the hive. With that single comb, it told the daily activities in a colony. They managed to see the forager doing the “bee dance”, telling the rest of the foragers where the food source was. Some house bees were busy storing “bee bread” food for the young. They noticed that some of the bees were of bigger size. They were the drones. They knew now that drones do not have a stinger. All of them were so envious of the drone because their job role is simply to eat, procreate and dies. They also managed to differentiate the cell size of the worker bee and a drone. Alas, there were no emerging queens because it was not the swarming season yet. Knowing now that the drone does not have a stinger, Olivia confidently held a drone with her bare hands. Everyone was eager to see the queen, but I told them we will have to be patient and locate when we bring that comb back first. She was not at that comb which we had brought out. 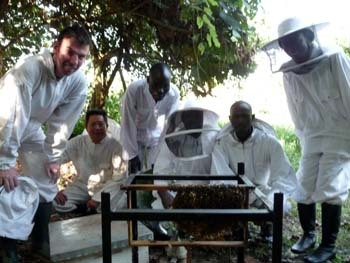 The training we provide enables a young beekeeper to have a calm environment to learn this trade. They were taught from the very beginning how to interact, to approach a colony without aggressive confrontation. 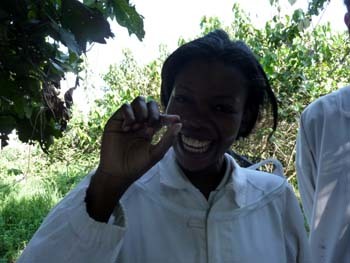 We first create a paradigm shift with the way they view African honeybees. If they were to be treated with respect and gentleness, they will reciprocate. The sad misconception of African bees being aggressive was eradicated from their minds. They being aggressive are because we made them so. We, human had treated them badly all these while whenever they go honey hunting. Over the years, Organization embarked on food security programs, only emphasize on giving free bee hives to make good reports. No attention was given on how to manage African bees. Failing to manage them lead to projects abandoned after the project is over. Think of the process, not the outcome. Their aim is to fulfill their personal needs rather than making sure the funds were spent objectively and prudently. They saw the African Queen…..
As part of the our on going training program, we have developed this video for our B.E.S.T. program. Participants are supposed to digest what they saw and during discussion, they are supposed to highlight the do’s and don’ts. Are you able to spot the mistakes? 17th Jan – 22nd Jan saw the first group of participants for the BEST program for 2011. 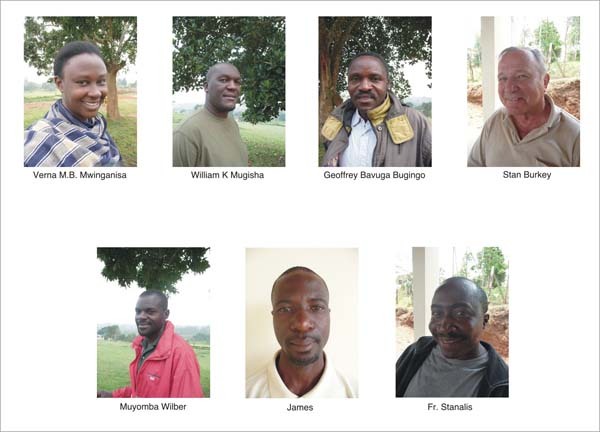 It was a diversify group because all of them came from various district in Uganda. Even the participants attended were getting more challenging. Some of them had never kept bees while there is one who is a beekeeper. He is 74 years old. 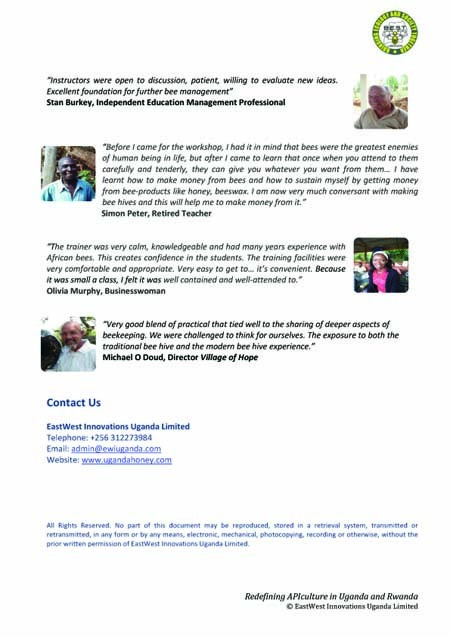 He had been in Uganda for more than 25 years as a development worker introducing sustainable agriculture activities through education on basic accounting and book keeping. They were prepare to go through the program to overcome the fear in order to embark on the business. Participants were taught to overcome the fear by gradually letting them handle colonies of different strength progressively. 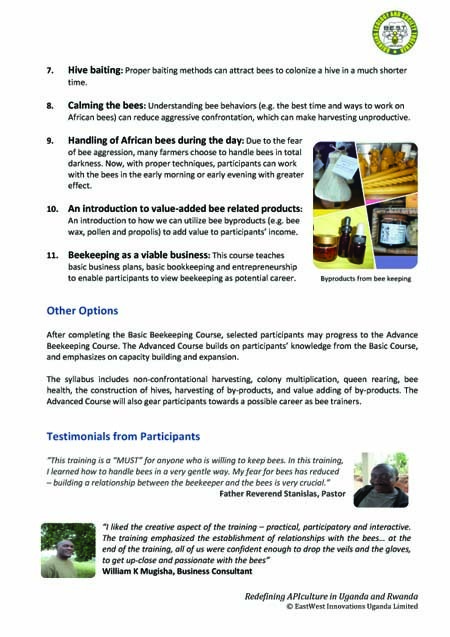 This training is a “MUST” for anyone who is willing to keep bees. In this training, I learned how to handle bees in a very gentle way. My fear for bees has reduced – Building a relationship between the beekeeper and the bees is very crucial. Father Reverend Stanislas is from Togo and currently he is pastoring a church in Lira, Northern Uganda. They had embark on beekeeping for sometime now but he felt that the project has rooms for improvement. He came for the training so that he came equip himself with more knowledge so that he can share it with his fellow folks in Lira. Fr. Stanislas is very hands on himself. The first of importance is how to handle the bees – keeping them calm, non aggressive, how to use smoke to calm and to move the bees. How to handle the bars – all in all, very practical and very hands on. Instructors was very open to discussion, patient, willing to evaluate new ideas. Excellent foundation for further bee management. Stan Burkey is a private consultant providing a very important component in rural development enterprise – financial planning, book keeping. Many small scale farmers do not know how to manage their earnings, calculate profit and loss. Stan would assist them in getting their books right. 40 years of experience in a few African countries. His contribution had enlighten many such farmers, turning them into entrepreneurs. I have realised that in order to benefit from beekeeping, one has got to know how to handle the bees and make them your friend instead of enemies. This program teaches how to use the bee tools in order to deal with the bees, not to mistreat them but use the tools to work with the bees. I so much like the hands on training that we have had which expels out the fear and panic. I aslo like the interactive training whereby you ask and discuss all that you have seen in the apiary. 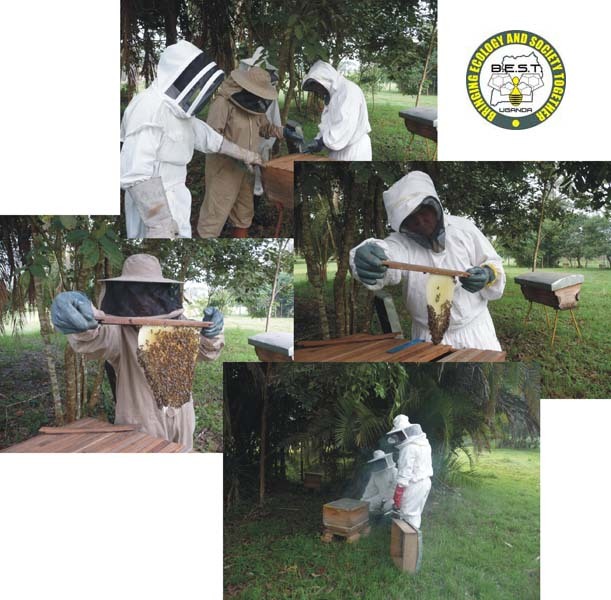 This training is introductory but really loves a lot of indepth information like how the bee behave and their program in the hive such that you know the time to work with them. Wilber force is currently working with an NGO is agriculture sustainability. He is embarking on this enterprise so that he can develop his own bee farm at his home. He hopes in the not to far future, he can use his apiary as a model bee farm to help his community to start beekeeping as another source of income to supplement their current earnings. 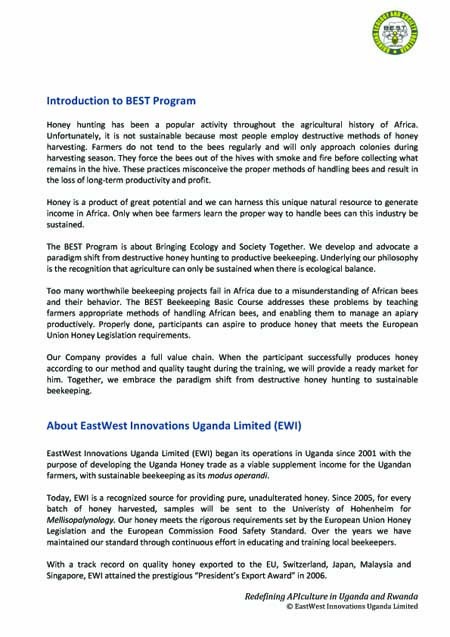 Lesster confidently evaluated The beekeeping Industry (based on his 10 years experience in the industry in Uganda) and gave us the challenges in the industry. The participants discuss the Bee-economics and individual prospective investment plan which he selflessly discusses. William work as an Information Systems Consultant in his own company where he is the Director. He is also an Associate Consultant at Uganda Management Institute in the Department of Information Technology. 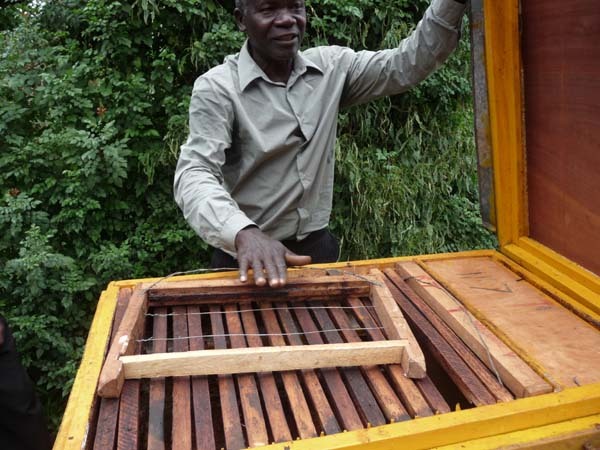 He is looking forward to start his Commercial Bee keeping as well as promoting Api-Tourism back home in Kisoro District and to create his own Honey Brand. One of our students had written about her experience when she attended our training on her blog. I would like to thank her for the feedback. You can get to see more pictures posted by her here. Past few days were spent running around town, getting all the documents prepared for the shipment. This morning finally saw the shipment ready for flight. The forwarder came on time to load the buckets up. Hopefully it will reach Switzerland safely and on time. Logistic management in Uganda still has a long way to go. One of my previous shipment, one ton of my honey was left at Entebbe airport for 10 days and nobody notice all the buckets sitting there and going nowhere. Luckily honey is non perishable. If not I will be in deep trouble. My customers were very amazed that how come such things happened. How to compete with the rest of the World if Uganda is not going to look at these issues seriously. Yesterday I was chatting with the Chief Veterinarian. 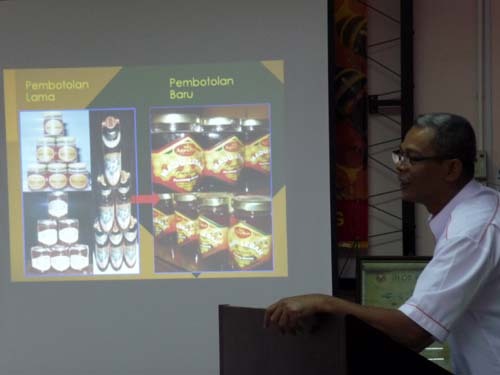 He is the person that will approve and certify all agriculture export like coffee and in this case, honey. I was surprised when he mentioned that we were the only Company that is exporting honey to Switzerland. He told me that honey going into EU is very difficult because of the stringent quality test required. He was glad that ours are able to meet the EU standards and being exported out. How he wished there were more honey with the same quality in the market. Honey harvesting season is over! El Nino had confused the farmers as well as the bees. When it was supposed to rain, it shone and when its time to shine, it was raining cats and dogs. This season the farmers had difficulties in harvesting due to the erratic weather. But still the show must go on. 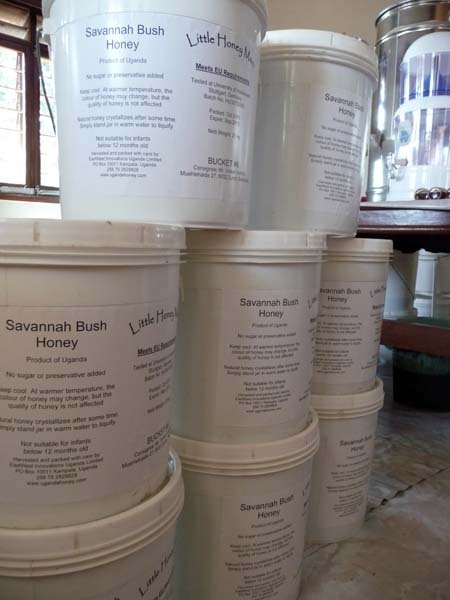 The next few weeks will be consolidation of all the honey buckets from all the parish within the range of 60 kms, All these honey will arrive at the collection centre to be weigh. The farmers will get their payment once we had finalized the quantum. Now that the honey season is over, we will be looking for other source of income for the villagers. Recently I had been in collaboration with a German friend of mine. He is into Shea butter production for EU market. We will be embarking on a joint co-operation so that our bee farmers and their wives can go into the forest to collect Shea nuts. It would be another good source of income for them. There is a whole demand for Shea butter now. Consumers are slowly appreciating the usefulness of Shea products. Its a good natural ingredient for cosmetic especially for skin. With the combination of our honey and beeswax and his Shea butter, we will be developing our first range of product – lip balm and moisturizer. 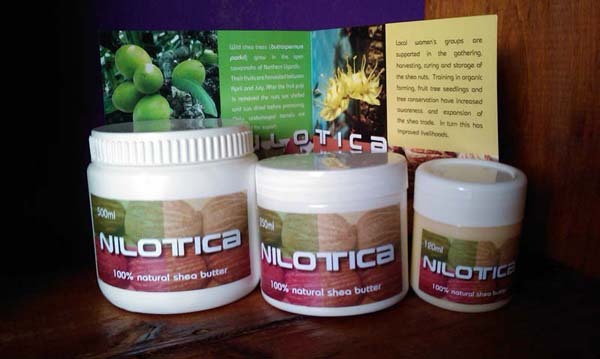 Meanwhile our 100% certified Organic Shea butter will be making its way to Asia later part of this year. 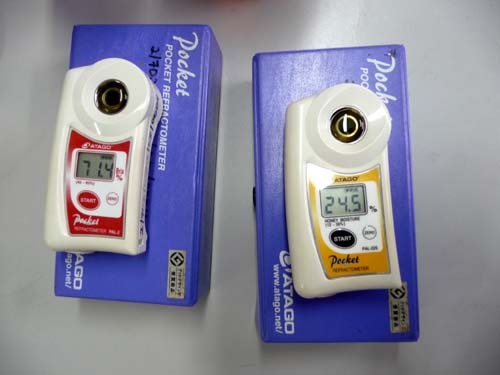 The product will be available at our Singapore Office. Final product - 100% Certified Organic Shea Butter. Three weeks with Jonathan passed by in a flash. Today we started to pick up where we had left off before he came. It rained quite a bit in the morning and our schedule was delayed a little. All the hives were soaking wet when we loaded them on the truck. Hopefully we are able to complete our work before Christmas and spend a relaxing festive season. Francis will be escorting the bee hives to Timothy Centre. Tomorrow he is getting married. Packing beehives into truck to be deployed at Timothy Centre. Off to Timothy Center, Masaka. Here is a sneak preview of my honey boutique. 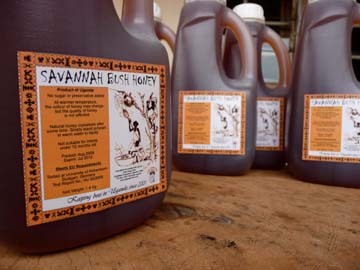 Eventually, it will house honey of different floral from different parts of Uganda. 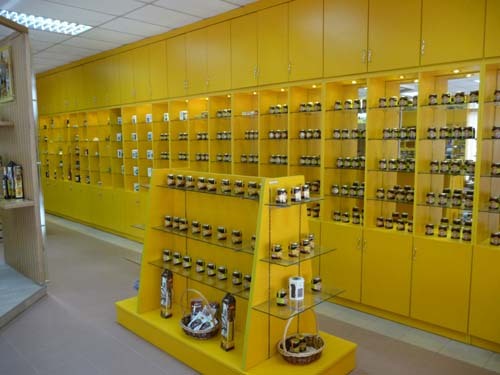 This boutique will be the first in Uganda which sells honey that meets European Union Honey Quality Legislations. Every harvest, samples will be sent to University of Hohenheim, Stuttgart Germany for melissapalynology. For a start, we shall be concentrating on honey, honey snacks for regular consumption. There will also be honey products that come in gift packaging for special events. Occasionally, we will have special “Comb Honey”. 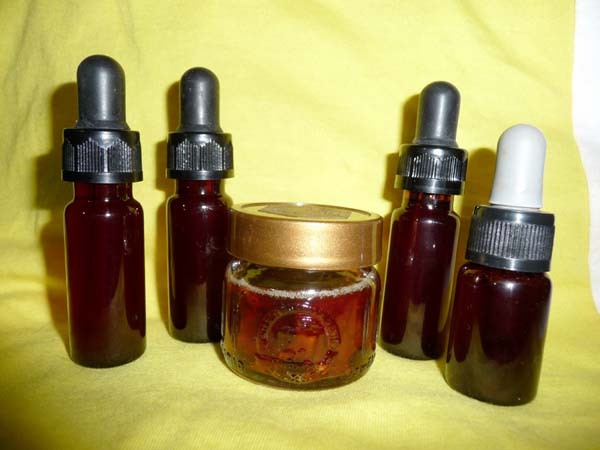 In the future we will include by-products from honey like, bee pollen, royal jelly and propolis. All these takes time because it involve a lot of certification and testing. Once its approved, we shall then launch them. 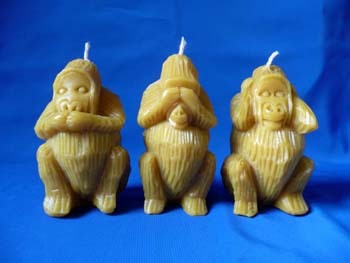 Meanwhile candles made out of beeswax are already on sale. My Honey Boutique in Kampala. Boutique will have a collection of honey of different floral from different parts of the Country. Honey packed in 450gm glass jar. 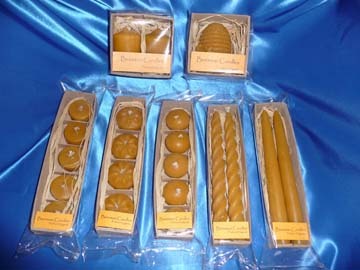 Banana fibre box set which include honey, candles and spoon. Clay hut contain small jar of honey carefully hand crafted by skilled potter. Little angels made out of beeswax. 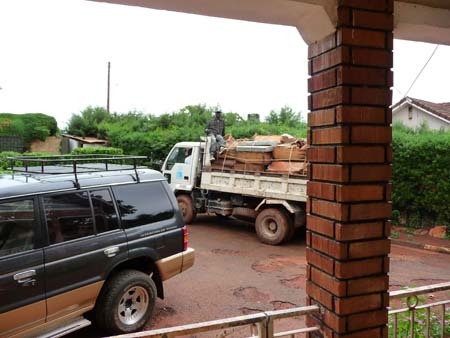 Gulu – Refinery and collection centre……………………. Finally the dry spell is over. The weather is getting cooler and the rainy season is coming. Its that time of the year where the villagers start to plant crops again. Going up Gulu with Fischer last two days was refreshing. Same time we look at the progress of the refinery and collection centre. Hopefully it will be ready when the next season comes in April 2010. 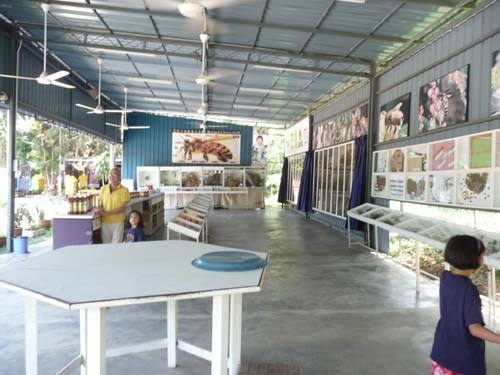 This Centre will serve as a meeting point for all the bee farmers around the region. All future honey harvested from our selected bee farmers whom had gone thru our training will be sent to this centre for processing. Come next year I will see myself being split between Timothy Centre which is in the South and Gulu, in the North. I hope I can have the strength to see it thru. PARIS – STRANGE as it may seem, bees get a better buzz from the urban Paris jungle than from the countryside. There are all sorts of flowers only short flights away, and little risk of death by pesticide. Some live in penthouse hives atop historically prestigious monuments – the spectacular steel and glass domed Grand Palais exhibition hall by the banks of the Seine, for instance. ‘Honeybees are happy in town, they have everything they need,’ said Grand Palais director Sebastien de Gasquet. Collecting pollen and nectar is no sweat with the Tuileries gardens lying only a short distance away, ‘not to mention the Grand Palais’ own flowerbeds’, he said. The two beehives set on the edge of the building’s huge glass dome last May are rooms with a view of the Eiffel tower and Notre-Dame cathedral. Three or four extra hives are to be added to bring production up to half a ton of honey a year. City bees, said Nicolas Geant, the beekeeper behind the Grand Palais scheme, nowadays produce four to five times more honey than their country cousins. ‘In agricultural areas you can produce around 10 to 20 kg of honey per year per hive while in cities you can get between 80 and 100 kg’ he said. And his idea of placing beehives at the Grand Palais – Paris’s Garnier Opera house has had its own beehives for years – is aimed at illustrating the paradox. In rural areas close to farms, there are fewer and fewer hedges, trees and flowers. But in the city ‘there are a myriad of small flowers in parks and on balconies, as well as a wide variety of trees along streets and in public gardens – acacia, lime and chestnut trees – that are nectar to the bees.’ While Paris is polluted, notably from car exhaust fumes, ‘this bears no comparison with agricultural areas where pesticides, fungicides and fertilisers kill massive numbers of bees,’ he said. France’s Union of Apiarists (UNAF) has signalled high mortality rates near corn, sunflower and rapeseed fields, while bee deaths across Europe have been 30 to 35 per cent higher than average since the 1980s thanks to a number of factors, including the use of pesticides. ‘There are practically no pesticides in the city,’ said Jean Lacube, the beekeeper in charge of eight hives at another Paris building in the city’s chic 7th district. City bees also thrive in a town’s more temperate climate, he added, and are safe from attacks by the deadly Asian hornet that has decimated bees in the south-west part of France in previous years. A few months back I posted this question in some forum regarding urban beekeeping in Singapore. Some of the replies were concerned about the danger of having bees around residential areas. Others feel that it is a good idea because the bee helps in pollination and its environmental friendly. On top of that with proper education and know how, one can have their own honey produce behind their backyard. Beekeeping in urban areas are very common in other parts of the World. Singapore has always been regarded as “A Garden City”. Can honeybees strive in this “Garden City”? What do you think? 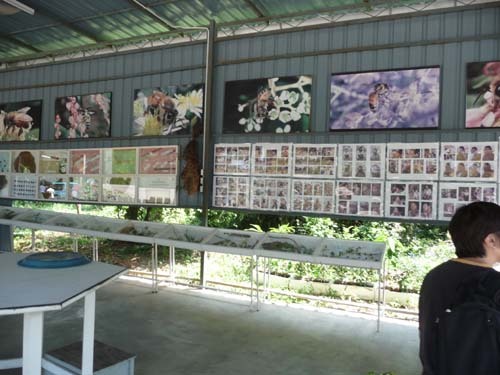 Chiangmai University – Entomology Department……………………. Was at the University beginning of this year conducting a feasibility study on rural beekeeping in Chiangdao, North of Chiangmai, Thailand. Here is a video footage while I was at the University observing some bees and having a discussion with the Professor. The honey bees they are using is a very docile species. Apis Mellifera Italiana. That is why it was not necessary for me to don on my beesuit. But when it comes to African bees, Apis Mellifera Scutellata, I will definitely have my suit put on with the veil flipped back. If they became aggressive, I will then fully cover myself. First part of the honey harvesting work is finally done! 🙂 Hurrah! The next part – getting the honey extracted from the combs begins tomorrow. 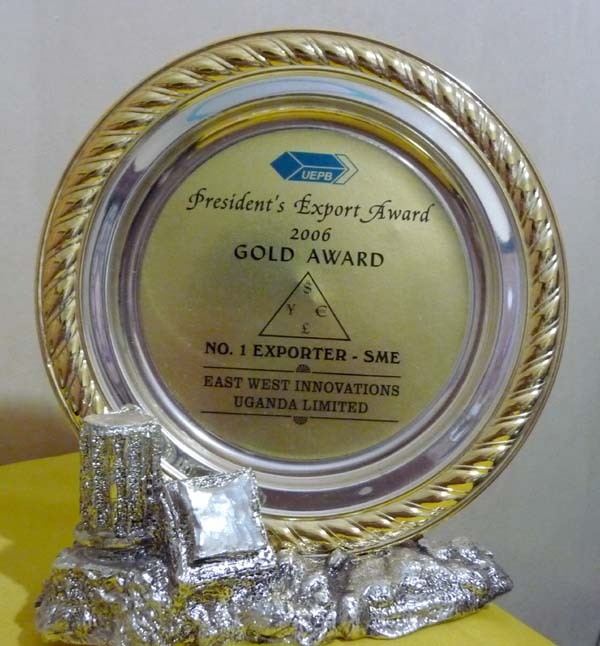 The journey of the honey from Gulu to Kampala took 10 hrs. By the time it reached Kampala, it was 2358hrs. This time round we had 2 more guys helping out in the transferring of the honey from the truck to the store. It took us 1 hrs to transfer them. Offloading of honey combs starts. House girl helping out in the offloading. Ugandans have very strong necks. Honey buckets neatly stacked in the store. 5 tons of honey neatly stacked. 95% of all these honey were harvested from traditional log hives. Honey samples from this batch sent to Hohenheim for test has met EU honey quality parameters. Many young NGOs always feel that only modern honey farming is the way to go. I feel that they have to do more studies before they come to that conclusion. They are throwing away good money by not having a better understanding of this industry first. All you can is all you can do, and all you can do is enough. Timothy Centre – the next big project!……………………. Carrying trial beehive to site. Honey season is over. I will be embarking on my next project – Timothy Centre in Masaka. Karl and I had known each other since 2005 and we had always been keeping in touch, discussing beekeeping. When he was given the task to develop a girls’ school in Masaka, he approached me to see whether would I be interested to join force and start a beekeeping project at this new centre. This is exciting for me for it will be another challenge in Uganda. Honey will never be enough for me because of the demand I am facing. Many challenges awaits me and the most difficult challenge I have to face is to instill proper handling of bees and honey onto the farmers. Timothy Centre is still at its infant stage and it is Karl and Arleen’s baby from now on. I hope with this apiary being setup, it will benefit all, including farmers around the centre. We will conduct beekeeping training for the farmers so that they will acquire another skill to improve their source of income. Identifying a good spot to place the beehive. Setting up an apiary is not that easy as it seems. There are a lot of preparation and also understanding the environment and surrounding. 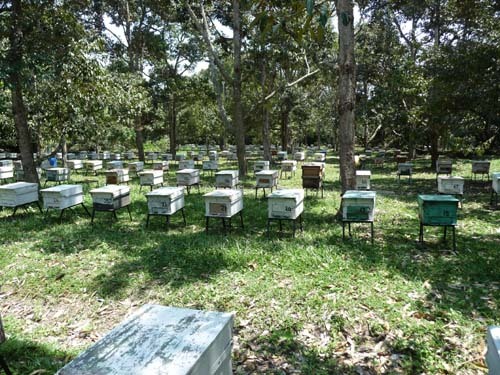 Once the apiary is properly sited, and when the bees colonized, it will be very difficult to change the location later on. Hopefully this trial beehive will enable us to do an analysis to see whether beekeeping is suitable here. If it is successful, I can forsee that this beekeeping project could well be my biggest project ever in my 8 years stay here. We had some indepth brainstorming session and the developing ideas we had is really exciting. I shall keep our plans for the time being until everything is concrete and finalized. It will take roughly about two weeks for this beehive to be colonized. If anything less than two weeks, it will be a bonus. Looking after a young colony is like looking after a baby. Much care and attention is needed if not they will abscorn and all your effort will be wasted. African bees are well known for their abscording rate but that is because not many really try to understand what’s the reason. Extracting honey from honey combs……………………. Honey harvesting season is coming to an end. To date, we have harvested about 2.5 tons of honey and would likely be able to hit our targeted 5 tons production by next week. I’ve brought back a few hundred kilos of honey combs for the extraction of honey. Comb honey are the best way to acquire from local farmers. This ensures that we can inspect the honey in its original form. 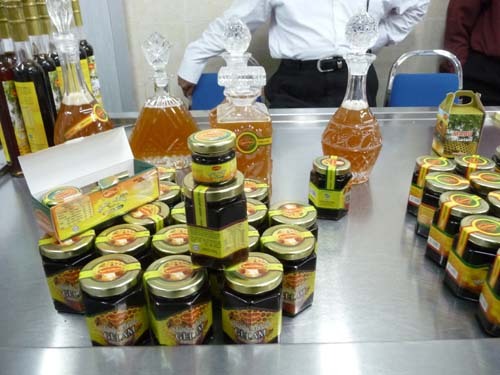 Very often, traders who buy honey directly from farmers, will likely to have the honey adulterated with mollasses or diluted with water to increase the volume before they sell them. So buying liquid honey from these traders is not ideal. Our company’s policy is that we only acquire our honey from the farmers that we trained in beekeeping. 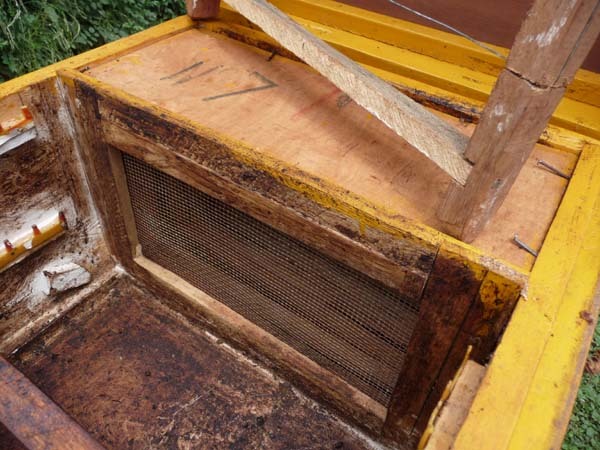 The initial few harvest, farmers will extract the honey combs together with our beekeeping masters. A few more followups will be conducted to ensure that they handle the honey with our best practices recommendations. Afterwhich, these farmers will continue to harvest their honey independently with occassional observations by us. 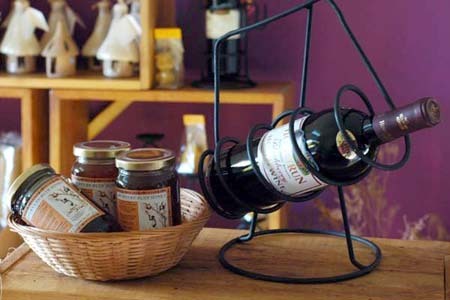 In order to make sure that the honey are still in its purest form, we only acquire raw honey combs from these farmers. We shall then process these honey combs back in Kampala. To ensure the quality and hygiene of the honey , we use simple honey presses to extract the honey. Farmers would however usually extract them using only their hands. Since Uganda Honey is only a small scale production line, two honey presses suffice to meet our honey production capacity . After pressing, the honey are then settled in tanks, (stainless steel tanks infront of the honey press), for a few weeks to allow any small particles of beeswax to rise to the top and removed. 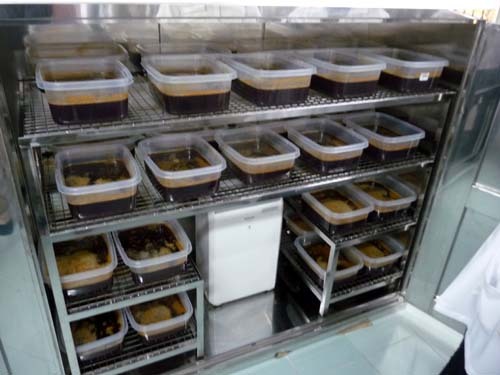 Meanwhile, these honey will have to await the test results from Germany before they are sold to our customers overseas. Chiang Dao – feasibility study, part 2. Professor Pichai Kongpitak and me. I had the privilege to be able to see some of his work. Clearing the feeder to have a better view of the bees. Carefully raising up one frame to observe the behaviour and activities amongst the bees. This box contains all the brood. It is called "The Brood Chamber". Close up view of the bees inside the observation hive at the University. These bees are a healthy lot! This part of my fact findings had given me more confident in crystalizing the direction for the bee farmers in Chiang Dao. The main issue lies in the sensitizing of the farmers and to guide them in making the correct decision for themselves. Let see what turn up next. Here you can see my collegue extracting honey from combs using a honey press. Honey in these form are as pure as they can be.